Try it out – but make sure you do something active today or whenever you are going to enjoy this dessert. Today I don’t have time to go to the gym because I have to travel into the city to teach a wine class, so I pulled out my Insanity CDs and did 45 minutes of cardio conditioning at home – perfect substitution and sometimes your own body weight can be just as challenging as those weights! Enjoy your weekend! Use a slotted spoon to transfer the pears to shallow dessert bowls. Pour the wine mixture into a small saucepan; bring to a boil. Boil until slightly thickened, about 6 minutes. 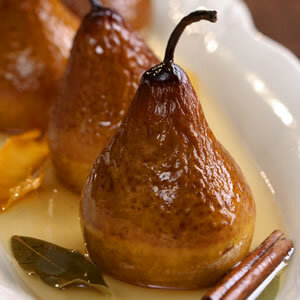 Drizzle over the pears and garnish with the cinnamon sticks, bay leaves and orange zest. Serve warm, at room temperature or chilled – with low fat ricotta cheese or fromage blanc (similar to creme fraiche but very low in calories. You may want to spice up the ricotta/fromage blanc cheese with some stevia or lemon zest, cinnamon, etc.